You must request permission to use the FloridaACE logo in any manner. 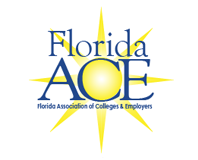 The logo can be used as long as the requesting organization holds FloridaACE membership and complies with restrictions on use of the logo that will be sent with a copy of the logo. All requests must be made in writing using the form below. Please include your e-mail address so that we can reply to your inquiry. Please contact the President or Information Management Director. FloridaACE reserves the right to refuse any requests for the FloridaACE logo for any reason. Please allow at least three business days for your request to be processed.